Well...maybe not furtive...but definitely furry! My wife Cheryl loves to take pictures since she got a digital camera, but she's less than diligent in downloading them to her laptop. She got this picture while we were at a sales conference for our new business back in February. On my show, I shared with the listeners about the bizarre group of people with whom we were sharing the hotel. 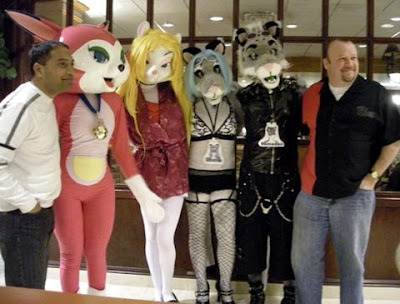 Seems there was a Texas Furry Fiesta going on at the Crowne Plaza Hotel in Addison at the same time we were trying to talk about frozen juice products. The highlight for me, was when we were in the bar waiting for the final night's dinner together and a single gray wolf strolled in confidently...almost arrogantly...walked up to our group, stood between Cheryl and I as if we'd known him for years, and put his "hands" on both of our shoulders. I just stared him down in disbelief and not a little bit of irritation until he got the message. It wasn't until two or three minutes later that I wished I'd simply had said, "Get your filthy paws off of me." But I offer this photographic evidence as proof that I wasn't making my furry friends up for ratings. Do you think anyone is even remotely interested? Now...there's an image that isn't going anywhere for a while. Nice to know that you've only been back to blogging for a couple of weeks and you've already managed to collect yourself a troll or two. Keep up the blogging, we're going to need more light on the murky world of metro politics in the future. I find it interesting. I have heard that Chris is in some kind of food distribution thing. If you don't find it interesting, then why are you posting on this blog anonymous?